This spring, the library will offer a new resource of particular interest to faculty and students in music history courses. The Online Music Anthology, from the music publisher A-R Editions, provides an extensive compilation of music scores and source texts for courses in music history and music theory, supplementing print score anthologies and improving the availability and ease of access to scores for students. A unique digital humanities resource, this library database brings together scores for works from antiquity, baroque, medieval, renaissance, classical, and romantic periods through to the 20th century. The anthology will support the teaching and learning of faculty and students in music history courses as well as the SMC community by making available sheet music for more than 600 works and counting. 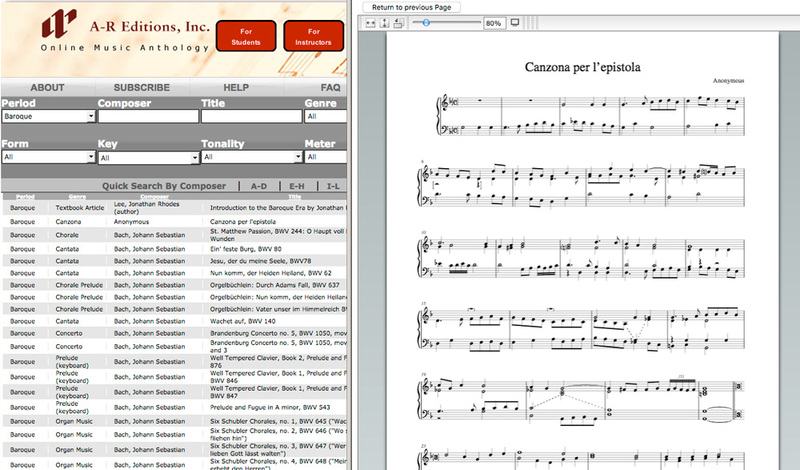 Works are easily searchable by composer, title, meter, tonality, and genre—from chants and concertos to symphonies and villancico. Faculty may create custom course anthologies, composed of sheet music from a diverse selection of works representing essential styles, genres and forms, which students can easily access online or print out. All scores are clean and precise images, standardized to fit 8½ x 11–inch printed pages. An online textbook with chapters by musicologists and professors supplements the scores by providing history and context. The SMC Library is delighted to offer this new resource and is eager to learn how it impacts the entire SMC community’s teaching and learning, in addition to supporting our Performing Arts Department. The arts are a vibrant part of the Saint Mary’s experience. Support the arts at Saint Mary’s by making a gift today.